Evident at the Gala Dinner Dance held in London in aid of the Children's Block of the Korle-Bu Teaching Hospital was the resolve of the gathering to make regular financial contributions towards turning the nation's premier hospital as a centre of excellence in the sub-region. The event, organised by the Ghana High Commission in collaboration with the Ten-Pounds-To-Save-A-Life Appeal Fund Committee under the distinguished chairmanship of Dr. Emmanuel Akuffo, a Consultant Psychiatric in the UK, climaxed activities planned to garner a substantial amount for the fund. It drew a cross-section of Ghanaian elite of the medical, legal, accounting, engineering fields, Mr. John Fashanu, Honorary Nigerian Ambassador for Sports and Tourism and Mr. Kwabena Baah-Duodu, Deputy High Commissioner, among others, to the high-profile extravaganza which featured a number of contemporary artistes. Teddy Osei of OSIBISA fame and his three-member combo ignited the atmosphere with rendition of old-time tunes, while Wang Yu's African Acrobatic Society sent the gathering into a frenzy. Songstress Ama Yankey, a budding Ghanaian talent scored high marks with scintillating songs from her repertoire. Adding to the musical extravaganza was the fascinating and command performance put out up by a top Ghanaian fashion designer Aku Sika Barrett, based in Portugal. The twenty minutes parade of the models in exquisite silkwear for various occasions added gaiety to the plush event. There were also a number of representatives of sponsoring British companies with links in Ghana such as De La Rue Currency, Ralph Martindale and Company Limited, Ghana Tours, FastLink Reservations and Regalon International. Other sponsors included the Ghana Nurses' Association, E6 Mason Agency, the New Patriotic Party (NPP) of UK and Ireland, Ahenfie Restaurant, First African Remittances, Unity Money Transfers and Aku Sika Barrett Designs. Ghana's High Commissioner to the UK and Ireland, H.E. Mr. Isaac Osei, set the tone for the two main speeches of the evening by calling on Ghanaians to follow the example set by Prof. Frimpong Boateng, Ghana's Premier Heart Surgeon and Chief Administrator of the Korle Bu Teaching Hospital, who abandoned his lucrative job in Germany and returned to Ghana to assist in the national development effort. He pointed out the elaborate improvements made by the hospital under his leadership and noted in particular the Cardio Thoracic Centre at the hospital which now attracts patients from all over the African continent. High Commissioner Osei added amid applause by the gathering that the wind of positive change sweeping the country since 2001 should encourage Ghanaian professionals to consider returning to Ghana to support national development effort. Launching the appeal for funds after a power point presentation on progress at the hospital, Prof. Frimpong Boateng associated himself with the sentiments by the High Commissioner and also called on Ghanaian professionals to give a thought to returning home to assist in nation building. He said Ghanaian professionals could use their expertise and skills to help re-position the country on the world map and assured the gathering that every donation made to the fund would be well utilized. Prof. Boateng's presentations and remarks touched the hearts of many at the event judging by the long queue of personalities who made extra financial contributions to the appeal fund. 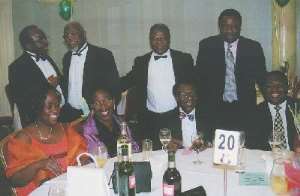 Picture: A number of Ghanaian doctors domicile in the UK and their spouses in the UK at the fundraising event. Standing fourth from right is Dr. Konotey Ahulu, an authority in sickle cell research.